1. How much does inscribing a niche front cost? We price our inscriptions by the line, per order, with a minimum charge equal to two lines. Approximately 23 characters fit on a single line. The more lines you order at a single time the more economical it will be. For example, an 8” x 8” front, if you order 4 lines of inscription at one time (two individuals in a niche) it will be $235.00, not $300.00 (2 times $150.00). 2. What does Eickhof inscribe? At this time, Eickhof only inscribes Eickhof products located in the continental United States that can be safely shipped to our location. These include single niche fronts and Memorial Bands® less than 16” wide. Eickhof does not offer “on location” inscription services. The following Eickhof Pre-Assembled models cannot be inscribed through our inscription service due to the nature of the niche fronts and other inscribable areas on these models. 3. Can more than 23 characters fit on a single line of inscription? Yes, but it depends on the letters themselves. The letter “i” takes up less space than a “w”. If you are concerned about how the name will fit, email it to us and we can tell you if it will fit. 4. How do I ship my niche fronts to Eickhof for inscription? Eickhof Columbaria provides specially designed shipping containers to send the niche fronts back and forth. 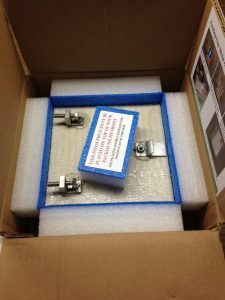 We replace the boxes on our end, at no cost to you, as we see the wear and tear of shipping. Columbarium niche fronts MUST be shipped in the provided reusable inscription boxes. Any damage resulting from improper packaging may result in additional cost for repairs or replacement fronts. You can send the niche front by any shipping provider that is the most convenient, or cost effective, for you. We will always return the completed inscription by UPS. 5. How much will shipping my front cost? The estimated UPS shipping charge is $25-$30 each way in the continental United States. 6. When should I have the names engraved? We at Eickhof suggest that individuals wait to engrave their names until at least one person is inurned in a niche. We have had many instances where a husband and wife purchase a niche and are eager to have their names engraved, but then, some years later, they want to sell the niche back to the establishment (because they move or other factors). The establishment will then have to use one of their spare niche fronts, or are required to order a replacement front. Replacement fronts can take up to 14 weeks to arrive. 7. How long does it take to engrave my niche front? We have a 3 day turn-around guarantee, not including the day we receive the front. The inscription can be finished quicker, sometimes, depending on how busy our engravers are. Please tell us if you need an inscription back to you by a certain date. 8. What is a highlight color? For clarity, letters on inscriptions are typically highlighted with Lithichome Shadow, a painted color in the depth of the inscription. Once this highlight color is approved by your establishment it will be used for your entire columbarium. 9. How should I choose a highlight color? When choosing a highlight color, please consider your chosen stone color. White would be your best choice on dark stone and Black highlight would look best on light stone. Brown highlight is typically used for cream colored stone while Gold can be used on cream or dark stone. Please be aware that some highlight colors may not show up as you would expect. If you have any questions on how the highlight may appear on your chosen color of stone, let us know and we can send you digital images, or a sample front, for your review. 10. How do I pay for the inscription? We will send you an invoice, separately, after the inscription is completed and ready to ship back to you. At this time, we do not have the ability to handle credit cards. 11. How do I start using Eickhof’s Inscription Service? To begin, please give us a call to let us know you’re interested in our service. Shown here is a list of things we will need to know from you. 12. What is an Approved Layout? A layout is the placement of the names and format of the dates as they will be inscribed on a single front. Your approved layout will be used for your entire columbarium. We have several standard layouts in PDF format below. These can also be emailed to you upon request. You can choose from these, or contact us to consider making a custom layout (custom layouts may be subject to increased inscription costs). 13. How does Eickhof keep my approved layout separate from other customers’ layouts? Each of our customers has a folder titled with the name of their location and establishment. In this folder is a “template” file based on their approved layout. We also keep every order made as a file titled the name of the individual inscribed. 14. Are there different fonts available for inscription? Yes. At this time we have several font options. Please contact us for more details. Our standard font is Optima Bold, chosen for the clarity of the lettering once inscribed and because it was designed for memorial use. About 90% of our customers choose to use it. If you do not indicate any other font we will utilize Optima Bold. 15. What size is the inscription font? The standard font size for an 8” x 8” front is 3/8” high. The standard font size for a 12” x 12” front is 5/8” high. Other font sizes can be requested but may affect the available characters per line and date format. Eickhof will not inscribe fonts smaller than the 3/8” high. 16. Is there an order form I should fill out? Yes, we provide, at no cost to you, a customized inscription order form. We create an order form for your location once we have your approved layout, highlight color, and address. These will be listed right on your order form pages. We have a blank order form page for you to view. 17. Can Emblems be inscribed on the niche front with the names? Yes. At this time we offer the five branches of military. For other imagery please contact us. We may be able to find a solution from imagery provided by you. Images for consideration must be black and white (no gray), crisp, and engraved at a single level of depth. Detailed emblems must be at least 2 inches in diameter, which can be limiting on the 8” x 8” niche front. 18. Can special characters be inscribed in or around the names? Yes, we offer a selection of standard special characters, such as can be found on a standard U.S. computer keyboard and Latin accented letters. Examples include using “quotations” or (parentheses) around nicknames or maiden names. For other language characters (for example: Chinese, Korean, or Hebrew) there will be additional costs due to a proofing process to verify correct characters are used. 19. Can you modify the date on my inscription? No. Once a name or dates have been inscribed, punctuation or spelling cannot be added or changed. 20. What happens if there is a spelling error? If a spelling error occurs on the customers’ side, either by the family or the establishment representative, a new inscription order must be made on a spare or replacement front. Any and all costs will be the owner’s expense. If a spelling error occurs by Eickhof, we will replace the niche front and the inscription at no cost. If none of these explanations answer your questions, let us know!